The advantage of growing Torpedo Onions is that you will get more onion production per square foot than regular Onions, because they are more slender and longer. As with regular Onions they are easy to grow and one of the most important vegetables in the world. Your most success will come from starting Torpedo Onions sets. Growing from seeds in flats easy, but requires more patience. 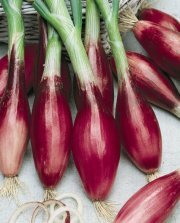 Torpedo Onions can be used as green Torpedo Onions within 30 days if grown from sets; or 40 to 50 days if grown from seed. Torpedo Onions are very adaptable when it comes to climate and is frost tolerant. Torpedo Onions will perform better in cooler weather. A constant supply of moisture ensures success with Torpedo Onions. 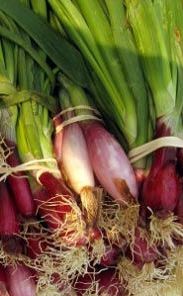 Torpedo Onions, as members of the allium family, are cousins of Garlic, Leeks, and regular Onions. They're biennials (grows for two years), growing the first year then blooming the second.